The Lebanon-Israel Border: Reasons for Peace… Excuses for War! “No pictures!” growls a burley Lebanese army captain, looking me deliberately in the eyes from not three feet away across his Major’s desk, while pointing directly at my Nikon. “No pictures!” he repeats, now staring at my translator. Since we are both seated in his office deep within the heavily armed perimeter of the army’s southern command, scores of heavily armed soldiers all around us, and these being the only words of English so far spoken by him, there was no doubting his sincerity on this point. Four hours earlier, 7:56 AM on a Saturday near Beirut harbour, day pack loaded and now stepping into the early dawn light, my driver shows up with a wave from his rolled-down window and pulls up in front. Climbing in, we are off. Destination: The Lebanon/ Israel border ninety miles south. Goal: To get there. These bellicose statements are of course specific admissions of renewed Israeli war crimes to come. These also ignore a second more obvious natural truth: The Lebanese border- as shown in Israel’s 2006 defeat- is a formidable natural defense and … a good reason for considering -instead- peace. Like many countries, Lebanon’s natural border is demised by mountains which here begin their ascent at the border uphill into Lebanon. Sadly and historically, for the past fifty-one years, Israel has preferred war to expand these borders. A trip today to their common border clearly shows this pre-existing defensive natural resource of ever-climbing banks of barren hills that overlook to the south what was once Palestine, now ready and waiting to help defend southern Lebanon…again. In lieu of recent events, this evaluation rings quite true and will likely become more divisive under incoming war-hawks, Mike Pompeo and John Bolton, who in tandem have expressed a disgust for any Arab interest not willingly at the behest of Washington and Israel. The factual analysis shows that it is Israel that desires to put forth military force beyond its current borders. Israel continues to provoke Lebanon and, more importantly, the Lebanese military that is, today, the dual defense of the Lebanese army and Hizbullah. Given this stark change to 2006, when the Lebanese Army didn’t fight Israel in the south, this new situation/ war would put two US allies at war with each other – the IDF and the Lebanese regular army which is supplied-sans rockets- by the US. Fresh from signing a very large and lucrative deal for supplying natural gas to Egypt, Israel two weeks ago set its military designs on a Lebanese natural gas field off Lebanon’s coast in its territorial waters. This sea area on the southern-most maritime border extends offshore along the edges of three Lebanese gas exploration Blocks: 8, 9, 10 of which Block 9 is said to be the most profitable. On the heels of Lebanon signing its own deal for exploratory drilling to begin, without justification, substantial sections of Block 9 were claimed by Israel. Since the works are to be carried out initially in Block 9, IDF boss Lieberman described Lebanon’s action of harvesting its own natural resources as “very provocative”, setting up an excuse for further threats these past weeks of a military showdown. The prospects from these gas fields are so promising that an international consortium led by the giant French Total, Italy’s ENI and Russia’s Novatek, a private oil company close to Vladimir Putin has stepped forward to bid for rights to drill and were awarded an exploratory permit in early February of this year. Consortium leader Total has announced the first well will be drilled next year in Block 4, an undisputed sector, and that a second well will be in Block 9, the block that falls partly within an area claimed by Israel. Total was quick to clarify that the Block 9 drilling would occur more than 15 miles from the disputed zone claimed by Israel. Kifah has been driving his own taxi for four years but has never been all the way to the border. Being Lebanese, he is not restricted from travelling as far as the last checkpoint before the UN imposed blue-line. 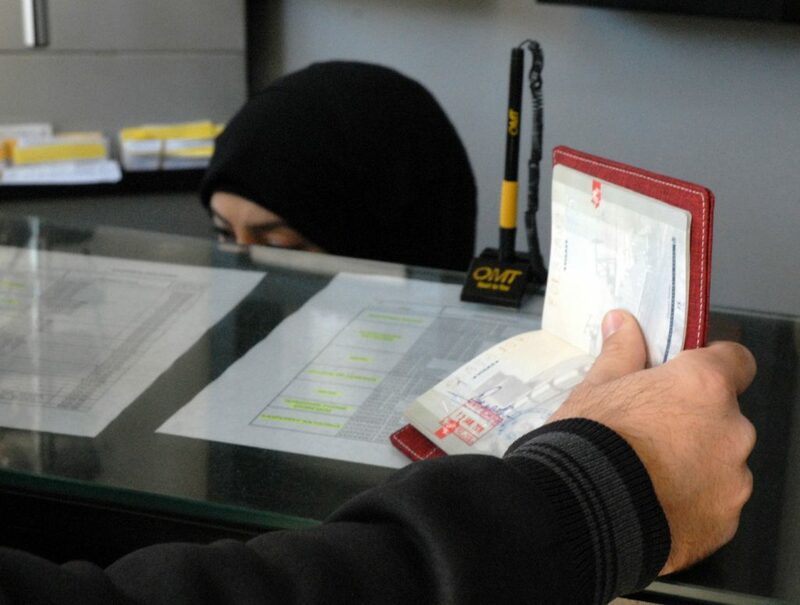 To actually get to the border everyone, especially nosey, foreign, non- Arab appearing journalists need formal permission from the Lebanese army command. There is no guarantee they will give it. Since the rules of transit change at the whim of the army as the local situation changes, this day is an adventure into uncharted waters. Not helping our cause, two days before this clear, bright blue morning, the Israeli Mossad attempted to assassinate Hamas senior official, Mohammed Hamdan, in Sidon, the town we are right now heading for in search of the same army command. Due to a premature detonation, Hamdan survived, his attackers already arrested; one in Lebanon; one in Turkey. Hence, if there is one particular person that the army is looking for it is Mossad agents. They are also not too keen on Americans, who are also banned from getting anywhere near the border. However, two major assets would be of great help this day: A Canadian passport and a track record of honest, on-scene reporting. One that prefers world peace! Most reporters heading south are on sponsored news junkets with all the details worked out for them beforehand, so they see only what is scripted. 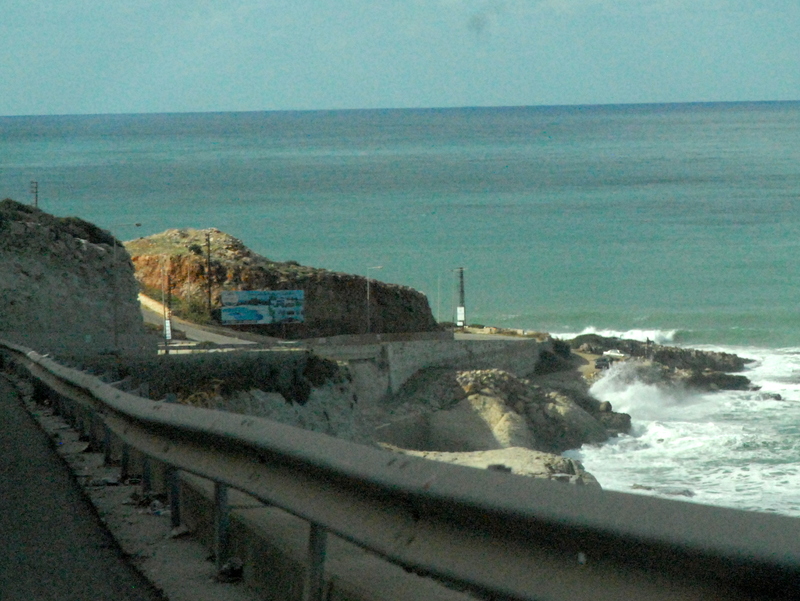 Alternatively, one might go it alone; put the beautiful and rugged Lebanese blue and grey rock-lined coastline on one’s right hand side, with the ever-ascending brown ,dusty denuded hills on the left, drive at high speed due south, looking across the expanses of dark green banana palms to the southwest side of the well worn four-lane highway, with… fingers crossed! Pointing south, the road signs all say “Palestine.” They do not say Israel. Forever in the minds of the Lebanese, much less the tens of thousands of Palestinians in the refugee camps, we pass-open air prisons in reality- this land beyond the southern border will always be Palestinian. Possession may be, in the mind of modern Likudist Israel, “nine-tenths of the law,” but the other one-tenth remains forever firmly in the realm of factual history: the history of a stolen land. The history of a stolen country. There is much to be learned from recent history at the Lebanon/ Israeli border. Beyond Israel’s claims on off-shore Lebanese natural gas fields provocation continues at the border. Israel has begun building a concrete wall inside the Lebanese border in violation of the UN cease-fire agreement of 2000. Beirut says it passes through territory that belongs to Lebanon but which lies on the Israeli side of the Blue Line. The area concerned is where the UN-demarcated Israel’s withdrawal from southern Lebanon in 2000. Other than provocation, Israel has no need to build this wall. Israel adds to these provocations by accusing its primary manufactured, non-expansionist, imaginary threat; Iran, of establishing supply lines to its secondary, manufactured, non-expansionist imaginary threat: Hizbullah. Post-2006 war, the Lebanese Army -at US/ Israeli insistence- was prohibited from possessing any airborne rockets or missiles at all, thus handing Israel military complete air supremacy. Israel of course previously used this air supremacy to devastate the civilian population of Beirut during their 2006 frustration of not beating Hizbullah into immediate submission. As Israeli threats against the general Lebanese civilian population trumpet from Tel Aviv almost daily, Hizbullah has reportedly established several missile manufacturing facilities within Lebanon. “In the battle for oil and gas, the only power you have, you the Lebanese people, is the resistance, because the Lebanese army is not allowed to own missiles,” Nasrallah affirmed. Israel cites this as a further reason to invade. Conveniently, Israel ignores any mention of its own massive military munitions pipeline and $3 Billion per year donation for same from its own patron: the American military. Missing, however, is the unspoken but most important reason for Israel’s drive to war. Yes, war may be again forced on Lebanon. Beyond territorial land and sea incursions or claims to restricting Lebanese civil defense, Israeli Prime Minister Bibi Netanyahu really needs a war. With the jaws of duplicitous justice closing rapidly in classic Ehud Olmert fashion, a self-inflicted conflict may be the only way out for the Likudist champion of expansionist Israel. However, the two most important reasons Israel and Netanyahu have as a reason for war are rapidly coming to pass. In less than n two months and in the near term afterwards, Lebanon will become autonomous both politically and financially. The first Lebanese national election in nine years will take place on Sunday May 6, 2018. The result will likely see Hizbullah continue on its new political path to power [see: Part Three] and thus formally, rather than practically, in power within the parliament. Although Hizbullah will like still need to effect a coalition government this will be a much easier task than a decade due to Hizbullah’s newly gained respects across the full breadth of the Lebanese political landscape and its unwavering support of the Lebanese people despite the device political antics of Prime Minister and turn-coat Saad Hariri. Before the world and its adversaries Hizbullah, in less than 45 days is likely to become the legitimate, certified and undeniable controlling political party in Lebanon. Combine this new political national autonomy with the financial autonomy that the massive natural gas reserves can provide an impoverished Lebanon will ultimately provide and thus collectively there becomes an autonomous nation that has a stable government and the financial means to be forever independent of western influence and coercion. This, of course, is anathema to the Huber-Hawks in the Likud party and the US state dept. that much prefers its recent examples of successful foreign policy in Syria, Iraq, Afghanistan, Yemen, Somalia, Sudan, Gaza, etc., al. Hence, Lebanese autonomy remains beyond the other proffered rationales: the most important Israeli reason for war. The first matter at hand on our journey south: where to get army permission? The army’s base in Sidon is the likely place to start so we begin asking for directions there at the checkpoints we start crossing-without a problem- just before coming into the town. Heading south from Beirut, the Army’s presence becomes stronger compared to the already obvious military presence across the sprawling city [see: Part Two]. Besides the increased number of troops, armoured vehicles from MRAP’s to tanks increase in number the further we go towards Sidon. In several places on the east side of the highway, these mobile armaments sit in clusters of six to eight, behind loose netting under makeshift canopies. They do not appear to be needed at this moment, however, all are continuously manned as is evidenced by soldiers sitting idly behind the wheel or stationed in the gun turrets despite them being parked out of aerial view, engines turned off. The historical effectiveness of a UN presence as a deterrent to invading violence and/or war is meagre at best, usually symbolics as it here at the border. The all-white vehicles roam all over the blue-line DMZ that provides a supposed buffer zone is all in Lebanese territory. Israel did not give up an inch. It is a sad bet that, if the IDF tanks again march north from Israel, these “observers” will be leaving northbound just as fast. Worse strategically, should Israel attack, the IDF will get an introductory, free, five-mile bite out of southern Lebanon before Lebanese defenses can react, courtesy of the UN’s Blue-line. Strangely, and apparently, illegally, the Lebanese army is currently operating UN marked weaponry. Showing their true intended effectiveness, every UN mobile gun that was observed travelling down the roads, although having a UN soldier also sitting in the turret, the machine gun had been removed reducing him to a purely symbolic role atop. 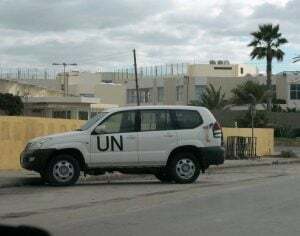 However, observed in the same areas, several all-white UN vehicles of the same type were seen with an all-Lebanese army crew driving, and a Lebanese army gunner also perched on top. Interestingly, there were two major differences between the two: the Lebanese army gunner was sporting a very obvious- and operational– 50 cal. What new UN resolution allowed for the army to commandeer and arm UN tanks and weapons remains unclear. After several inquiries after reaching Sidon, we find the military base’s single entrance; a massive steel barricade swinging down shut in front of us as we approach. On either side of our car, two soldiers watch us carefully, automatic weapons in hand as a fifth walks up to the window. Through Kifah we understand that we are in the right place, but must park in town and walk back. The military, as evidenced by the bombing in Sidon only days before, are very worried about car bombs. When we return we are escorted into a concrete, windowless bunker-like office adjacent to the steel barricade. There, an army officer dressed in casual street clothes- the men with real authority don’t wear uniforms- starts asking questions about our business. He too does not like cameras and takes my Nikon and both our mobile phones before sending us back into town to copy my passport and Kifah’s drivers license. War seems on the horizon. No one is taking any chances. Returning with Kifah-now walking- through the barricade once again, the officer goes through my passport page by page. He is looking for an Israeli visa stamp, an automatic bar on further travel south. He asks questions about my business in Lebanon and does not like the many US visa stamps he sees. He wants to know, “ why?” Calling someone on the phone, he releases us with instructions to go to the next office in search of “the Major.” The camera now returned, but the phones still in his possession, after having been frisked, we walk in the seemingly right direction, armed soldiers coming and going all around us. Finding the right office, the next plain clothed officer inspects us over again watching me particularly and asking the same questions. He then calls the first officer from the barricade on his phone, staring me up and down while getting confirmation that we are still the same two people who passed minutes before. Satisfied, he sends us further within the base to an old, de rigueur, a military two-story wooden building surrounded by a dozen or so soldiers who are all watching us closely. Enquiring about our appointment with the major, we are told to go upstairs. As we tromp noisily up to the creaking stairs to the wooden planked landing, five offices are in front of us while over twenty uniformed soldiers sit on simple wooden benches in a long hallway without their weapons. They are new recruits, just arrived and waiting for deployment elsewhere. They lack the battle-hardened stare of their compatriots outside. They smile pointing to the office of the Major, just around the corner to the right. Seated in the Majors office now, it turns out that he is busy and will not be back for some time, so we hunker down for a long wait. Kifah’s been a huge bonus, taking the lead as he translates our quest to a growing list of very suspicious military officials. We’ve gotten to know each other quickly on this trip, having met on the way to the Syrian embassy earlier that week. Like many Lebanese, he has seen the realities of war already and desires peace. He tells me much that day about today’s Lebanon [see: Part Three]. Thankfully, soon another officer comes in, his rank unknown since he too is in street clothes. Sitting down at the Majors desk abruptly, he calls the previous checkpoint to verify us yet again, then snatches-up my passport and engages in a furious discussion with Kifah that, due to his tone, is not going well. Looking me up and down repeatedly, his subject seems obvious. In Arabic, he asks about my business, who I write for and what are my intentions at the Israeli/ Lebanon border? He has me write down my address in Beirut, my mobile number and publications I write for. Arabic is spoken very fast and has no route in western language, making it almost impossible to follow at all. However, the word “Google” snaps my attention twice. Before permission can be granted they will be checking me out-closely. Handing me back my passport and tossing the business card to one side casually, he hands Kifah a small white piece of paper, with Arabic writing on it, then picks up a huge binder stuffed with paper sized sheets of unknown origin. Finding the first blank space he enters the copy of my passport and his notes so far. “ No Pictures!” he barks and repeats the command to Kifah along with other info. I do not understand, then with a dismissive wave of his hand sends us back down the creaky wooden stairs and out into to the daylight and a camp filled with soldiers. Lebanon disagrees with Israel over the precise demarcation of the Exclusive Economic Zone (EEC) between the two countries which was established in 2010. The prime actors at present, in addition to the governments of Israel and Lebanon, include Russia, Hizbullah, Syria, Iran and the US in the shadows. The latest Israeli attacks on alleged Iranian bases or Hezbollah camps inside Syria are closely tied to the Israeli aim to prevent a land link from Iran through Syria to the Hezbollah home-base infrastructure in Lebanon. In 2010 the oil and gas geopolitics of the Mediterranean changed profoundly. That was when a Texas oil company, Noble Energy, discovered a huge deposit of natural gas offshore Israel in the Eastern Mediterranean, the so-called Leviathan Field, one of the world’s largest gas field discoveries in over a decade. Until recently, political paralysis inside Lebanon and the war in Syria had prevented Lebanon from actively exploring its offshore gas and oil potential. Russia is engaging in Lebanon in a bold way. At a formal ceremony in Beirut on February 9, together with Lebanese President Michel Aoun, the heads of Total, ENI and Russia’s Novatek signed the first agreements to drill for oil and gas in the offshore sector claimed as part of Lebanon’s Exclusive Economic Zone (EEZ). For Lebanon, to develop its own sources of natural gas would take it into the first world and out of debt and social poverty. The country has been subjected to electricity blackouts since the 1975 civil war. Daily, Beirut residents must experience cuts in electricity because the peak demand exceeds production by a large margin. Currently, Lebanon must import expensive diesel fuel at an annual loss to the economy of some $2.5 billion. Lebanon is one of the world’s most indebted countries with debt to GDP of some 145%. The Syrian war and internal Lebanese political stalemate had frozen its offshore energy exploration until now. A UK company, Spectrum, conducted geophysical surveys in the offshore Lebanese section of the Levant Basin in recent years, including 3D seismic, and estimated that the Lebanese waters could hold up to 25 trillion cubic feet of economically recoverable gas. Obviously, development of those gas reserves would alter the entire economy of Lebanon and thrust its government into the geopolitical limelight of petrol- dominance. This is of course for great hope for the Lebanese people… and great angst for the Likudists watching helplessly to the south. As we walk back through the main gate to the car, Kifah explains that we do not yet have permission so far, since it is the Major who decides, but we have been instructed to kill time for two hours and call the number on the white paper for the results and yes, they would be checking into my professional sincerity all the while. 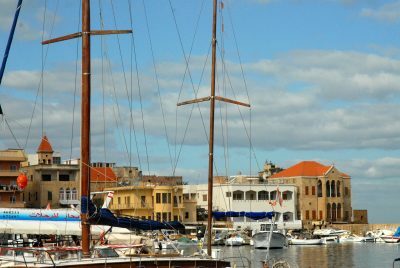 The fact that we have been given the white paper is encouraging, so we head further south into one of the oldest cities in recorded history, Tyre. Kifah has suddenly gotten a bit jumpy, an inconvenient trait that would surface too often in the next many hours that day. Asked what is wrong, he says that the officer has made it clear that we will be watched and that any problems that might arise will be in his head. Indeed an understandable emotion considering the progressing depths of our collective adventure, however, as I remind him, there is, in reality, no danger to us at all. We are merely doing a job, with- so far- permission. A quick high-five and we are immediately out the door and into the car again and heading south beyond Sidon. 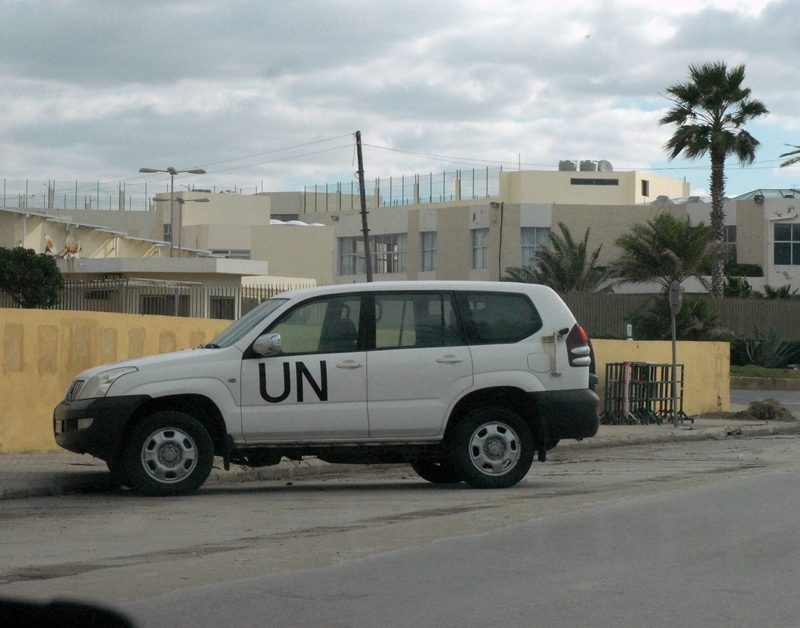 Now, the military presence has increased yet again but has been added to by a very large contingent of the all-white UN military vehicles with very large black “UN” letters on each side. They zoom by us in both directions, some with turret guns- sans the gun- some are just pick-up trucks of several makes with flashing blue and white lights on their roofs. These commingle with the much smaller Lebanese army presence there. We are still north of the Blue-line, army territory still, as we pull into the first checkpoint south. Again, my passport is inspected as the soldier uses his mobile phone to call the number on the white paper as his counterparts on the other side of the car watching us carefully as always. Any semblance of friendliness is now over. Fingers remain on triggers, left hands on gun barrels ready to aim and fire without pause. Here, the unknown is the enemy. We are the unknown. No one we will meet wearing a Lebanese army uniform from this point on is taking any chances. War is in the air. The soldiers know it. We know it, too. You can just… feel it. Satisfied that we are indeed number sixty-seven, the soldier waves us along. We have just crossed the last checkpoint before the blue-line. We are now where few foreigners have ventured. We will make it to the border as planned. Good news indeed. Kifah, however, is getting nervous…again. Our goal, the border, is dead ahead, barely five miles away. Besides the white UN military presence, there is another reality that comes into view- our goal: the seemingly innocuous hills of southern Lebanon border. The hills that have too often before proved to be as defensively resilient as the Lebanese people. For those who recall the accurate results of the last Israeli war against Lebanon [see: Part Three], one strategic fact is undeniable: These hills are defense worth 10,000 men. The Israeli’s in 2006 found this out. Those same hills are still there, unscathed, as is their ongoing defence against invasion. Starting at sea level at the coastal border, the brown almost treeless hills of Lebanon rise ever steeper as one drives inland, due east along the Lebanon Israeli border. Peculiarly, these hills slope most steeply towards the south and towards Israel as they rise ever higher to the northeast. In Israel’s 2006 rush to war it was these hills that provided a very effective natural barrier to their northbound incursion. Deploying hundreds of tanks that came in waves across this wire-mesh fenced border, these tanks were slowed by these hills- leaving them as sitting ducks to Hizbullah and their Russian made Kornet anti-tank rockets (see: Part Four). Airpower is practically useless against the tactics of ground-based guerrilla warfare, and the IDF in just 33 days was reduced to running out of ammo while their troops were decimated in a ground war- sans armour- all of which had been destroyed. Israel had no choice but to retreat under a cease-fire, taking the burnt-out wreckage of over 200 tanks with them. Touring the border via these hills these same natural defenses are now stronger than before. In 2006 every house and village on this side of the border was completely destroyed by the IDF. This is evidenced by all the houses in the area being very new in construction, with many still being built. Some of these houses sit atop these hills, looking warily to the south or to the west over the full panorama of the Mediterranean. However, as these hills slope steeply up, now rocks in the form of huge boulders line the south side of the roads and the southern slopes of these hills. As confirmed by a source who fought here in 2006,[see: Part Three]these have been placed there in the past ten years for good reason: Israeli tanks do not care for steep hills… and they do not fare well over large jagged rocks. A tank, despite its massive steel might, is as weak as a Tonka toy when encountering rocks, since the rocks break the tracks rendering the tank motionless, its driving wheels spinning furiously and uselessly. The hills by themselves presented a formidable obstacle in 2006, but since these boulders have been placed along the south facing width of many of the hills. To the casual observer, these have been seemingly built to create long terraces going up the hills in a series from their base to the top and might be used, as some are, for the planting of olive trees. However, on closer inspection, it is easy to see that these boulder-strewn terraces contain very few trees. These are not primarily for agriculture… they are in practicality tank traps! Taking the last hard left turn just barely at beyond the last border check and now driving due east through these hills the Israeli border is more than obvious on the right-hand side. The current borderline is essentially a shallow valley between two rows of hills parallel to each other, the southern one; Israel, the northern; Lebanon. Lebanon’s hills are bigger and look out over Israel the more one travels east parallel to the border. While one can lose sight of the actual demarcation line- a single barb-wire topped fence- a continuing series of hundred foot high steel braced communications towers line the top of the Israeli’s southern hilltops every 400 meters and are never completely out of view. The rather unimportant border fence wanders out of sight sometimes in the dry creek of this border valley. Despite reports that Israel is moving men and machinery to the border region, there is no sign of it. The Israeli side seems quiet. The hills block the view of the recent troop and artillery build-up being massed there by the IDF in preparation for new war. The border fence seems rather diminutive and benign, just two hundred yards away now. While UN and Lebanese army trucks zoom about the border and roam the hills, no movement of any kind is seen on the Israeli side of the fence; an ominous silence that is, considering daily newspaper reports, fooling no one on this side. Kifah is getting jumpy again, probably because we have just been accosted by a UN soldier in an all-white pick-up truck asking more pointed questions about our purpose. I want to go further east, he now wants to turn around and go home. His English is good, so while I stretch my legs after hours in the car I carefully explain to him that he is in no danger at all, which does not yet register. This was unfortunate, but a necessary development in our growing friendship. Fortunately, a mile or so later we are flagged down by a local Arab worker- he is Palestinian- needing a ride to the next village east. Using this opportunity I have Kifah ask the man several questions about this area and of any potential danger on either side of the fence. The stranger, nonplussed, tells us many things but assures us, as suspected, that there is nothing to worry about. Dropping off this man in his tiny dusty village, Kifah is again relaxed. I am dying to take pictures, but with the officer’s stern warning still in mind, the fact that the Lebanese observations towers are never out of sight of us and that we are the only foreign object likely to entertain their view, it is a safe bet that we are being watched. So…no damn pictures. Gaining altitude over Israeli as we head directly east, the Lebanese hills becoming appreciably bigger, we can now see into Israel beyond their hilltops into the agricultural regions filled with farmland, lakes, pastures, and the Kibutzes of occupation. This area was once Palestine. It is now Israel. For only one reason…war. Driving East, it becomes obvious why these hills have been a very effective barrier to further incursions. We continue to ascend high above the Israeli expanse of much flatter land that is thus far more suited to agriculture and the green pastures and brown stripped crop fields are easily in view below next to irrigation ponds and small lakes. Here in these hills, similar agriculture is not possible and the only evidence is many dishevelled looking olive trees growing out of the hills sides. Lebanon has some very developed agriculture but that lies in the mountain valleys some 20 mile north. Defensively these hills are a formidable barrier to war because all wars need ground forces and artillery to advance and here, as in 2006 moving north will always be a slow progress. An example was Israelis loss of almost 200 tanks in 48 hours [see: Part Three] due to this too slow a progress. If Israel chooses war again these hills will remain defensive and an obstacle in getting as far as the capital, Beirut. Although Israel has been provided complete air superiority by the UN, when facing the necessity to move forward the IDF must have armour and armour must move across the ground and these hills. This was a disastrous development for the IDF in 2006 and will be again if the IDF actually fights Hizbullah and the Lebanese army and actually uses its air force against military targets rather than innocent civilian ones. Israeli territory takes up the remaining arable land that continues about thirty miles north of this east-west border area as it takes a turn north towards Syria. Should Israel elect to attack from this position it will by-pass these hills, but have new series of even steeper ones that separate Lebanon from Syria and ring some of Lebanon’s best agricultural valleys. This leaves little advantage for Israel beyond accepting massive casualty counts no matter how much military might it sends north or west. It was this body count that stopped the last war at Israel’s request. Will Israel have the short-sightedness to ignore their own self-imposed history and death toll? Despite the many justifications and fabrications being echoed for new war recent developments may be the reason for Israel to, this time, choose its fate more wisely. Novatek, the huge Russian gas consortium, is one of the major partners in harvesting Lebanese natural gas including Track 9. Russia also has a tract record-despite massive US/ EU propaganda to the contrary- of promoting peace as has been documented accurately in the changing of the fortunes in Syria and the final demise of Daesh (ISIS). This could be a game changer against the drive to war since the tag-team of the US and Israel is not used to an even match and certainly, Russia is more than capable of evening the fight- or at least protecting its investment. This week’s American re-staffing in seeming preparation for a return to more worldwide war, torture and wanton civilian death came in the manifestation of neo-conservatives Mike Pompeo and John Bolton to power. This does not bode well for the rational US thinking or Israeli restraint. Added to the already laughably amateur demonization of Russia via the Skripal poisoning set-up, it appears the US and its willing proxies are all too willing to rush to war and hear only the drums of war. Driving back west on the same narrow rough road, the day is almost over. The sun begins its slow descent into the Mediterranean horizon far away and below our vantage point across the southern Lebanese hills. The beauty of this panorama cannot hide the realities that the winds of war are now blowing in furious gusts from the south, across a simple barb-wire fence, meters away to the left. Ukraine? Syria? Yemen? Iraq? Afganistan? Libya? Venezuela…? All destroyed, their countries ravaged, the futures and the happiness of their people now being toyed with like a sick, demented child smashing underfoot the slow-moving, defenceless snails, one by one, while merrily stomping along a rain-soaked footpath. On these same winds of war, there is a horrible sound. It does not bode well. Is it the sound of the horrors of war? Is it the sound of the screams of the innocent? Is it the sound of lives forever shattered? No. It is the sound of silence. It’s growing quiet as we wind back down slowly to sea level. In my time in Lebanon, almost constantly I saw the remaining ravages of wars past. Bullet holes last a long time. Despite this past, Lebanon maintains an optimism in its people that has somehow managed to transcend these repeated horrors. There is a jovial spirit and a kindness here. There is optimism for a new future that is better. This future, like that of the remaining civilized world, deserves to be defended. We, the civilized world, cannot accept and then witness the same fate for Argentina, Brazil, China, Russia before we act. For Lebanon? Will we continue to ignore wholesale fact and truth and accept the lies instead? Will we accept growing atrocity and the sacrifice of our humanity rather than rise-up and demand peace? Will we continue to sit in silence? If the answer is to be yes, then it is time for what remains of the civilized world to seek safe a final haven. It will, then, be time for everyone to… head for the hills!